When was the last time you joined a gang? Ok, maybe not a gang but a club or team? A well established one? It’s a bit daunting isn’t it? You hope you’re going to be welcomed on arrival; you torment yourself with the thought What if no one speaks to me? and ask yourself Why, exactly am I doing this? Well, Serena is the main reason my first scooter meet was the best possible experience it could’ve been. 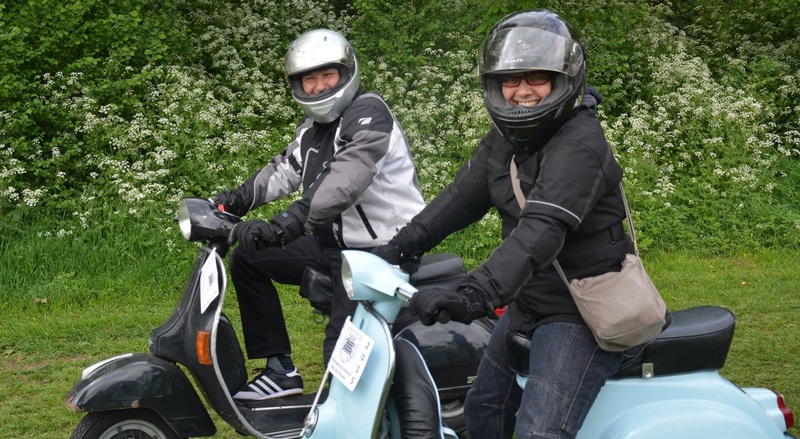 Last year, having just gained my motorbike license and, finally being able to ride my scooter (Beryl’s engine is too big for a CBT), George and I went on our first scooter meet. One sunny Sunday afternoon we headed north and rode a whole 4.3 miles up the road to Sturdy’s Castle in Kidlington. This wasn’t just my first scooter meet, it was my first time riding two wheels on a proper road, with other road users and everything! My first rookie mistake: I dressed to impress rather than appropriately and for safety; I haven’t made that mistake again! By the time we pulled in to Sturdy’s I was cold, and terrified thanks to an aggressive truck driver overtaking when there wasn’t room, forcing me over onto the verge. Anyway, I digress: We’re on our first ride to meet new people, on a couple of scooters that aren’t exactly designed to arrive incognito. We pulled up and parked (once I’d done an impromptu lap of the car park, stalled, struggled to kick-start, stalled again and then, finally parked …facing the wrong way! I received the standard ‘spousal feedback’: Why did you head into the car park? Why didn’t you just pull up here? Why did you park facing that way? (Me: I don’t know! Because I did! What a stupid bloody question! ); conversations that can only be had between husband and wife! Anyway… as soon as we parked up, the lovely Serena Chamberlain came over, HUGE smile and camera in hand. After a wonderful warm welcome (and photos) Serena introduced us around and took some more photographs. I am, honestly not over-selling that experience when I tell you that Serena made that first scooter meet a complete joy. She didn’t just break the ice for us, she made us feel welcome and part of the group. Serena is a natural sociable networker, who people gravitate to because of her warm, honest, open and friendly nature. It’s been a real pleasure to get to know Serena over the past year; she’s a heavyweight (in a petite package) in the scooter scene and was a natural choice for the Icons and Influencers series. I was absolutely delighted when she agreed to represent the women scooter riders. Tell us a little about yourself and where you live? Crikey! Where to start (and when to finish!). My name is Serena and I’m 46 years old (sounds like I’ve just entered a self-help therapy group). I was born in Aylesbury at the Royal Bucks Hospital – only those who reside in Aylesbury and are of a certain age, would appreciate that comment – and moved to Bicester, Oxfordshire twenty years ago. I’ve been married to Gavin for 26 years, and we have two grown up, independent and awesome children (I am extremely biased) and immensely proud of them both. We have recently acquired two fluffy gorgeous kittens who are brothers, named Archie and Cosmo (hugely mischievous, cheeky and totally adorable – all at the same time). I met Gavin when I was fifteen and had just entered the foray of the Scootering World. First impressions were that he was a cheeky sod and that I wasn’t very impressed at all. When we first exchanged pleasantries, he (in jest – I think!) whacked his crash helmet around the side of my head and nearly knocked me out. We became friends, and then best friends; by our second date I knew that we would be together forever. I wisely kept that to myself at the time. During sensible working hours, I work in Customer Services for a local baking company, which gives me the ideal opportunity to talk all day long and earn pennies to fund my sociable non-sensible waking hours. 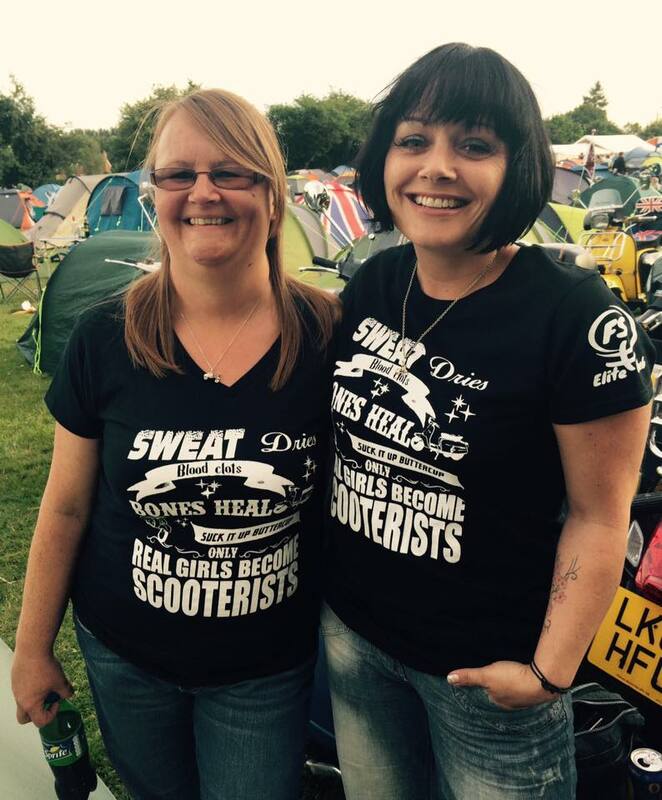 I’m a member of Red Kites Scooter Club, which is based in Thame, Oxon and includes members and other like-minded scooter souls hailing from Oxfordshire and Buckinghamshire. Alongside our family and feline friends (which are THE most important things in my life) my main passion is the Scooter Scene. Scootering truly is, a way of life and simply in your blood, always and forever; it never goes away. However, I am also easily distracted, constantly amused and forever fascinated by many other things too; such as reading anything and everything from fiction (vampires and fantasy), travel and culture, through to historical facts and figures, particularly the Plantagenet/Tudor era. I read Scootering Mag (cover to cover) the SIP book (my bible) and Sticky’s Manual (the pictures are SO pretty … I’m kidding, I’m trying to learn a little mechanics). I love Northern Soul, dancing, musicals, the theatre and the open road on two wheels. I’ve discovered I love scooter racing, having attended my first race last year. I enjoy baking (often badly; I’m a little experimental or, perhaps I just don’t really pay attention), writing (mainly nonsense); Star Wars and Stormtroopers (and Ewoks) and Penguins! Oh gosh… I’m fascinated by people, sparkles, stars, the Universe, and Aliens (please don’t be frightened – the truth is out there). Game of Thrones is a recent passion (winter is coming) and I have an inept ability to absorb all manner of useless and rubbish information, but it keeps me happy and amused, which probably explains why I smile so much. Can you introduce us to your scooters? I currently(!) have three scooters, all on the road, which is nice and unusual; classic scooters aren’t renowned for their reliability. 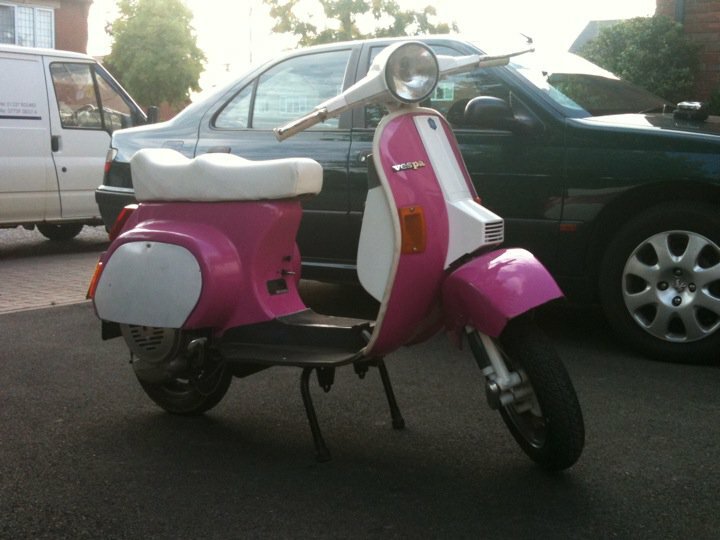 “Bella” is a Vespa 100 standard smallframe, and was a 21st Birthday present from my Husband. She arrived in a sorry state, and remained that way for pretty much 20 years; our eldest learnt to ride a scooter on her, and our youngest would have the occasional ride on the back. She was given to my big bro’ for a little while; he swiftly gave it right back when he found out they were expecting triplets! Around my 40th Birthday, Gavin and I returned to the scooter scene after a ‘short’ break of about twenty years, which appears to be fairly common for our age group. Bella was transformed with some fantastic welding and a total re-spray courtesy of Hodge and Supersprint. Within a year, I bought a PX200E and named her Olive. I found Olive on Fleabay, which instigated a memorable van road trip with Gavin and Curly (fellow club member): One weekday evening, having rushed home from work, we set off on a 350 round-trip to Aberystwyth on the hunt for a strange and quirky little cottage in the middle of nowhere, returning home long after midnight. The experience was so surreal and, so enamoured and besotted was I with Olive and the magical cottage (and rather unique seller) that I often wonder whether the cottage ever existed at all. 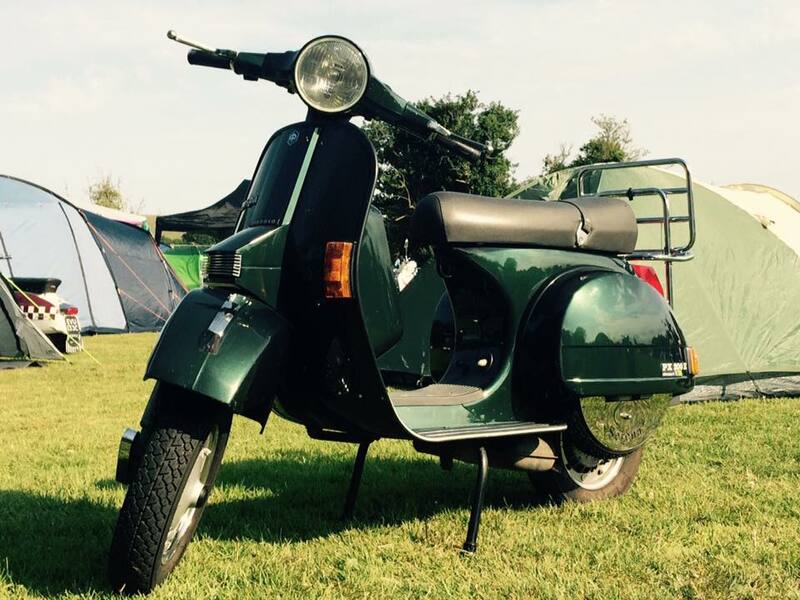 I began using the smallframe for local events and ride-outs, saving Olive as my rally scooter and for longer journeys. Olive took me on my first European trip to Holland in 2014, and proved a lot easier to scoot two up, with our daughter who, at the time, had started to attend scooter days and weekenders/rallies with us. I’ve always been a Vespa Gal but began hankering for a Lambretta after riding a GP at a local rally, which belonged to Sam, my Red Kite ‘partner in crime’. Eventually, I managed to save up all my pennies (not easy after spending and attending too many parts fairs and rallies) and, with a little help from a sympathetic Bank Manager I found my white standard GP200 after a very quick and impatient search. I am still so chuffed to bits to just own and ride a Lammy although, strangely, it remains nameless being referred to simply as “My Lammy”. I’ve recently begun to spend time on My Lammy re-wiring and rebuilding some basic bits and learning some of the mechanics. The trick, of course, is actually remembering it all but, I do really enjoy getting my hands dirty and finding out which bit works which other bit. How did you first become involved in the scooter scene and why is it important? I was fifteen and hanging about with other kids my age when two of them had begun to embrace the Mod scene and enticed me (against my will, because I was so bloody lazy) to walk up the road to our local shops where a lot of scooter peeps had recently begun congregating and just hanging out. My big bro’ was a Mod (but not scooting at this time) so, I already knew a few of the people. One night I strolled over to hang out, to look mean and moody, and pretend I was a rebel (without a cause); I was instantly smitten! I was fascinated by the people, the music, the lifestyle, the noise, the smell and, the scooters! I loved the diversity of the group and all the exciting things they talked about: The events, the rallies and, more importantly, the freedom. I can’t explain why it’s so important to me. I’ve wondered if it’s the physical scooting itself or the friendships; the places and memories. Perhaps it’s all of those things. There’s a saying: if I have to explain it, you wouldn’t understand it but, I can’t really understand or explain it to myself. When I returned to scootering, after raising a family, it felt like coming home; it made me feel complete, whole again. It’s part of me; it’s who I’ve become. 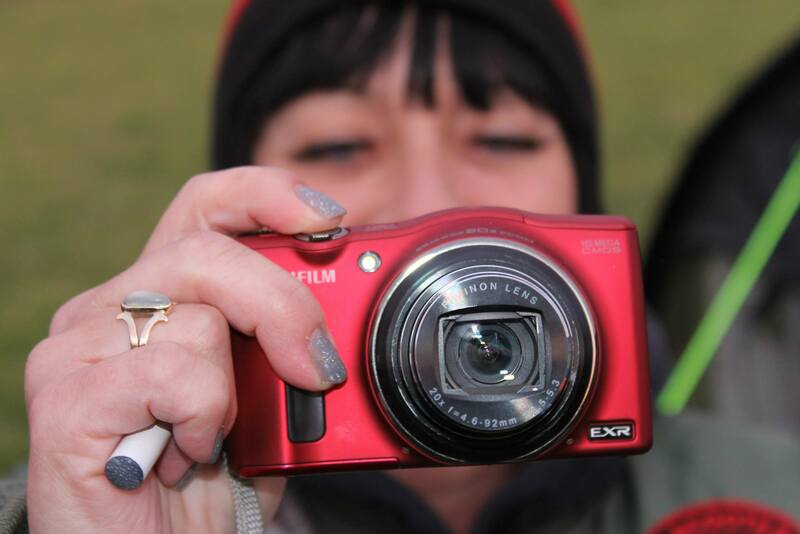 How did you get involved with the Red Kites? The Red Kites was set up in 2007 and founded by Michael Clark, well-known for his lifetime Lambretta passion since the early 60’s including scooter sport, racing, gymkana and, literally, travelling thousands of miles and still attending Euro Lambretta. However, we hadn’t yet re-entered the scene at this time, and it was probably another couple of years before we returned to Aylesbury Scooter Club for socialising and scooter days. We already knew Sam & Simon Gee from the Red Kites (although Simon wasn’t officially a Kite then either, we were hanging out at Aylesbury SC together) but we began spending more time with the Kites. I had started my scooter life with ASC and later with the Aylesbury Necrophiliacs; it’s a close community within Bucks/Oxon and everyone knows of each other; so it’s all laid back and cool, we all integrate and socialise. The Red Kites appeared more in tune with my hopes and desires for what I wanted to do, and where I wanted to go so, we took the plunge and joined the club …and never looked back! The Red Kites are my extended family and I’m hugely protective, supportive, loyal and fiercely devout to them. There is definitely something extra special within your own club group because of what you share and experience together (on the road, personally, emotionally, camping, rallying). But, it’s also fair to say, I feel much the same about ALL Scooterists in our gigantic Worldwide family too, because we are ‘as one’ and, just as loyal, protective, supportive and loving across the Globe. My partner-in-crime Sam and I are both points of contact within our club. We help to promote and organise events, and try to be a useful contact for other clubs, organisers or enthusiasts. Along with our IT Guru Ian, who has done an amazing job with the setup and upkeep of our website, we also help out by updating our events page and trying to keep it organised and useful for both club members and other local scooter clubs. Can you share some of your fondest memories of scooter rallies (and maybe a worst)? 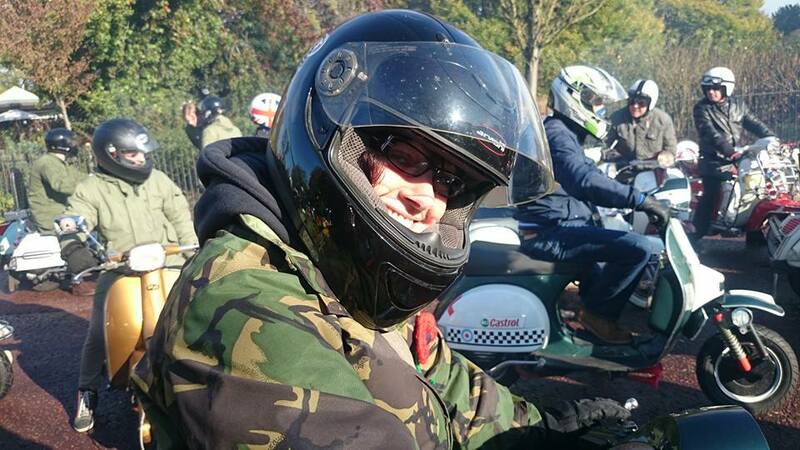 Every scooter rally is special to me, each one supplying fond memories because of who I shared them with; the laughs, the trials and tribulations. Each rally is unique because of the distance and location; the scooter you rode there on, and the people you meet along the way. I have many fond memories of stupid moments and hysterical laughter (you know those times, when you return home with aching cheek bones?!). For me, the most important thing is the journey because I just love to scoot (anywhere) and that makes each rally special. Maybe, also because you always remember the journey there and back, but remain a little vague about what you actually did while you were there (and with whom). I adore seaside rallies the most; fabulous moments and memories of roadside breakdowns or slight ‘engine malfunctions’. There are usually lay-by shenanigans, and sometimes torrential rain, thunder storms and, if we’re lucky, scorching heatwaves. The people you meet along the way; the scenery as you ride, the planned route and the unplanned (getting lost) ones too. However, being huddled around camp fires, talking nonsense at six a.m. 6.00 or late at night; the dancing, the music and bands, the banter, the scooters, the sunset, the sea, the stars, scooting around the Island (Isle of Wight) and down to the coast and castle (Modra); attempting to mount the Bucking Bronco and taking part in the scooter games at Mersea, all happy places. It’s exciting to experience travelling to new towns/rallies abroad (Holland), including the satisfaction of actually getting there, safe and sound AND still on your own Scooter. You never worry about getting back home again …until it’s time to leave! It’s always such a thrilling feeling to scoot through the gates of whichever rally you’re attending …it really is a surprise that somebody doesn’t sound the claxon and let off the party poppers!! There are so many rally recollections amidst a jumble of fleeting and rapid snapshots. Naturally, everything from the 80’s will forever be shrouded and viewed through rose-tinted glasses: The sun was always shining (of course it did) and we were never cold, tired nor hungry. You forget just how dire the camping facilities were back then, until old photo’s remind you. One of my ever lasting memories was watching Edwin Starr at IOW in 1986, singing “War” accompanied by the entire crowd, in the pouring rain and wearing Post Office issue waterproofs, thinking how wonderful my life was …until the riots happened that night on the campsite. The worse rallies are when something truly awful happens to a fellow friend and scooterist, it’s beyond sadness and forever tragic. Scooter theft is also horrendous and causes anger and frustration to us all. I deplore all manner of violence and unrest – it’s totally unnecessary; we’re a scooting community and should be big enough and old enough to avoid it. Which scooter rally would you never miss and why? I’m a staunch and avid supporter of the BSRA (British Scooter Rallies Association) and National Rallies in general. If I could afford it, I would attend every single one. The Nationals are the very core of what we are, who we are, and how we came to be here, together! However, real life doesn’t afford me that luxury (quite yet) so, I like to mix it up a little each year and I manage to slot in a few weekenders and local rallies, which are easier on the pocket and holiday leave. I would adore to scoot abroad again; I loved the recent updates of VCB Croatia this year (#envy) and the LCGB Euro Austria, among others. I simply love to scoot miles of open road; the Welsh Rallies don’t appear to suffer the pothole epidemic that we do so they are always a favourite, and I am desperate to fit in a Scottish Rally (it’s been way too long since the last: Girvan in the 80’s !!). Each rally appeals to me for different reasons, but we do tend to pick Modrapheniacs in March as our first Rally of the year; we’re normally chomping at the bit after Winter. Camber used to be a favourite (sadly, now finished) and Isle of Wight holds a special place; it was my first ever rally in 1985 (via car …I was only allowed to attend because my older Brother was going in his Vauxhall Viva). Mersea has become a club favourite and is on the calendar each year, along with Weston Super Mare, and we’ve had amazing weekends in Woolly and Warmwell. In truth, I wouldn’t miss any! Two words: Wet Wipes! An AA/RAC card (always!!) and a woolly hat. It doesn’t matter what time of the year you’re camping, a good, warm hat keeps you snug and cosy and, girls …it helps to avoid “bed head” and scaring your camping buddies first thing in the morning. I always pack flip-flops (sometimes two pairs, don’t ask me why, I have no idea), a bottle opener, a torch, mascara and lip salve – apparently that’s all you need in an ideal world. …In MY world I pack for a two-week vacation in the Maldives and Antarctica for a weekend away in the UK, and still manage to arrive at rallies forgetting at least one essential and useful item. I admire those who pack everything into one plastic bag, and use it all; empathizing with those, like me who seem to have packed their entire wardrobe and still manage to dress inappropriately for both the venue and the weather conditions. Proper riding gear, armoured and waterproof! I embrace this, it does makes sense due to our age and family responsibilities, and because I want to continue riding for many years ahead, I want to feel safe, BE safe and be seen. I can no longer scoot without sensible clobber and footwear anymore, it makes me feel naked. I’ll admit, it feels a little weird to be sensible and grown up but, I do feel passionate about this. Although I respect fellow scooterists own beliefs and decisions I do promote safety, verbally and visually. It would be fabulous to have more affordable choices for women’s riding gear. I feel we’re a little short-changed on affordability and choice, although this is slowly changing. But, PLEASE manufacturers, stop making everything so pink! Or lilac! We just want something that fits our curves. There are still too many of us girlies stomping about in men’s short jeans (because they have a greater choice of leg length) or, wearing flappy armed jackets because the men’s jacket sleeves are so long. Also, I always pack Peggy Jane cards to pass on to unsuspecting but, obviously totally delighted scooter buddies. My good friend Maggie designs and produces the artwork, cards and gifts and I help out a little by promoting her website and ideas. Tell me some of the comments people have made because you’re a woman on a scooter; what shouldn’t someone say to you because you’re a woman on a scooter? 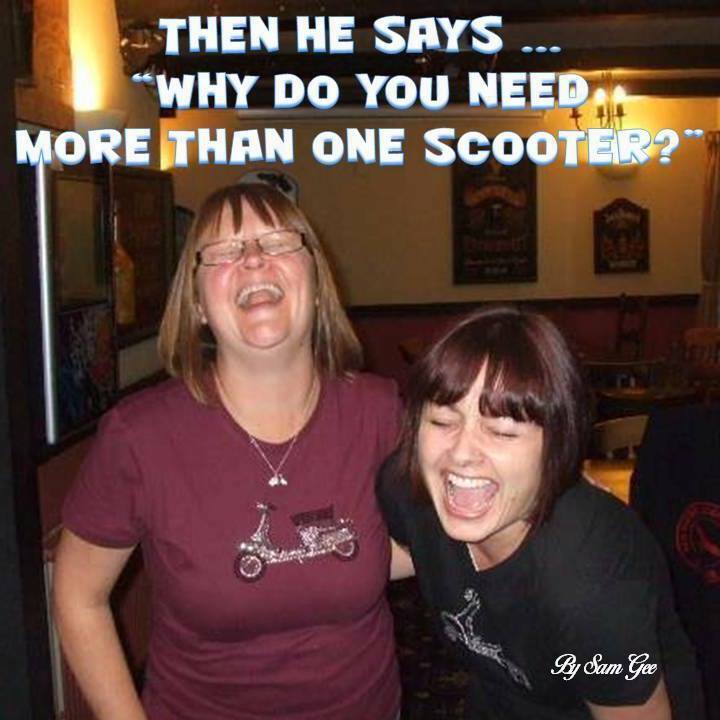 Scootering has always been male dominated, and I think most women would agree with that, but are happy to join in with the banter and “take it like a man” and not be too offended. We give back, as good as we get (if not more!). But if somebody were particularly offensive I’d let them know about it. It amuses me when you get chatting to someone at a rally where you’re from, how long it took etc. and halfway through the conversation, they might say Oh, you actually rode here? Well done you! Yeah, not condescending in any shape or form, huh? You wouldn’t say that to a bloke (perhaps we should!). To be fair, all the guys that I scoot with are not judgemental at all and treat me as a scooterist, and that’s been the way, from the very beginning. The guys are supportive but expect you to ride the same, and why not? Learner riders are always given a little more encouragement and protective riding (which massively helps with confidence and is nice to see) and us girls do the same with newbie male riders too. It’s equal, as it should be. 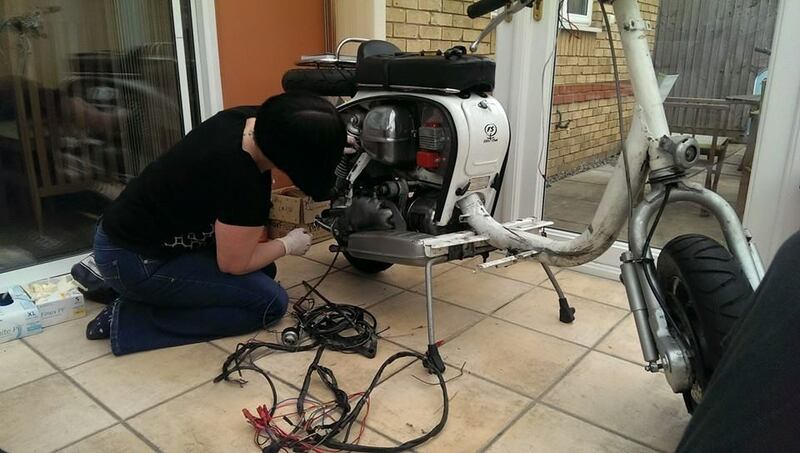 The guys are way ahead with mechanical capabilities and it’s hugely encouraging and inspiring to see more women working on engines, rebuilds and spraying scooters. I recently began working on my own scooter, which has generated only helpful advice and encouragement from both men and women. Aside from the odd cheeky remark about putting the kettle on (and don’t forget the biscuits! ), I have appreciated all the help, support and encouragement I’ve received from my fellow Scooterists, who are always keen to share their knowledge and expertise. When it comes to receiving negative comments, I’ve probably had more grief directed at me from other road users of the four-wheeled variety. In most cases, the comments are ignorant, misguided and wrong, and duly verified by me; backed up by the guys I’m riding with at the time. Filtering or scooting through city traffic tends to generate the most negative and ignorant remarks, which will usually be directed toward the women rider first. It’s often an eye opener when they receive swift and prompt feedback from a female scooterist; they don’t expect us to have a voice and an opinion. How has the Scooter Scene changed for women over the years? Initially, I didn’t think that the scene, for women in particular had changed dramatically. We’ve become older (and wiser), gained confidence and experience along the way, and are just as eager for the same opportunities and experiences that all scooter folk would like. We also have a little more disposable income than we did when we were younger, which allows us to indulge our passion and make the most of it. We still have the same respect shown to us and the same amount of piss take. However, the one thing that I have noticed – is that we are becoming more and more independent; for travel, mechanics, re-builds and spraying – maintaining our own scooters and running scooter shops and workshops – and that’s a great thing to see and admire. When I first set out on my Vespa 50 Special, I was lucky enough to scoot alongside quite a large number of female friends. It felt good to have female company (solidarity) who could share the same experience and show support. Having said that, I don’t remember seeing a lot of girls riding their OWN scooters to rallies. Many were pillion passengers or just attending events and rallies …some were even entering wet t-shirt competitions (can you imagine that today!). We definitely have more female scooterists on the road today, which is a wonderful thing. We all, women and men, bring different experiences and enthusiasm to the scene. There have been huge changes within the scene; it’s evolved as we’ve evolved and matured. With age comes experience; we’re probably more thoughtful and caring now. Unfortunately we’ve also experienced losing loved ones and seeing others suffer. 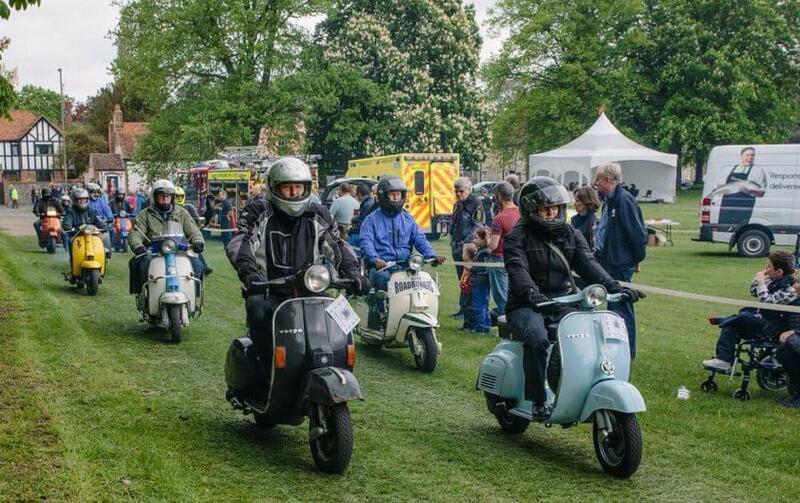 The scootering scene today, is an imposing and influential collective, which gives us a wonderful opportunity to promote causes close to our hearts. Charity fund-raising and promoting local projects are now an important part of the scene, which certainly wasn’t there when we were younger. The Red Kites Scooter Club always choose a charity each year, which is promoted at our End of Season Do. The charity is often selected based on a subject that’s close to the heart of a person or group of people within our club. This year, our two chosen charities were selected in loving memory of two loved ones; both partners of Red Kite members. Social media also play a big part in our community today. We can easily feel connected to our community, and instantly share a vast amount of event news and information, which is in stark comparison to how we lived our lives in the 1980s. In the 80s we had no mobile phones, no texting, limited communications (assuming you could even get to a phone …or, if your parents had fitted a lock to the ‘house phone’). We had limited photographs, due to the high cost of developing them in your local chemist, which could only be ‘shared’ with the person sitting next to you! What advice would you give your daughter (and the new generation of scooterists)? Our daughter had a PK50 for a little while and learnt to ride a scooter on a Rally. Incidentally, it was a Rally 200 (proud Mummy moment). She loved scooter days, the rallies and events, but college life and other interests led her in a different direction. She ultimately decided to choose four-wheels and now drives a Fiat 500. However, if she WERE to have ridden, I would have encouraged short trips and local journeys for confidence building. Riding with a small, trusted group is excellent for gaining experience and greater confidence, and I fully endorse attending Biker Down. In fact, I recommend that ALL riders, irrespective of age and experience attend a Biker Down course. 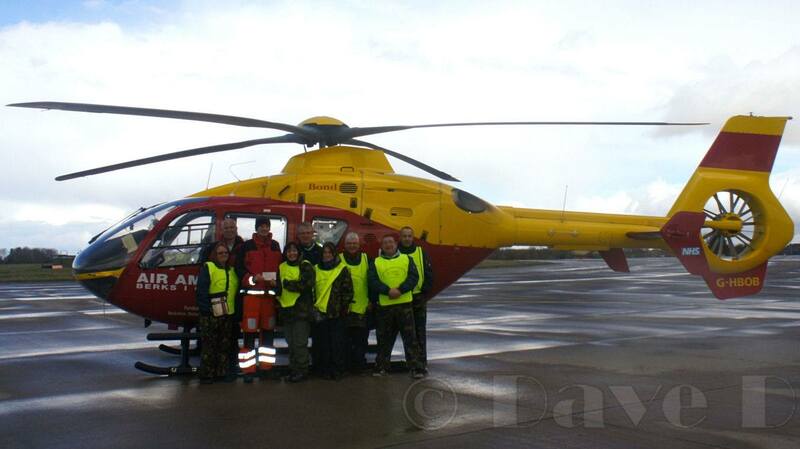 The Red Kites recently attended a local course, which turned out to be a real eye opener. The events are run by bikers and emergency service professionals; you can expect a fun and social evening while learning essential rider and first aid information – I was surprised by how much we, as experienced riders learned. Bottom line: Be safe and be seen! Wear proper clothing and always, ALWAYS be one step ahead of other road users. Unfortunately, it’s only experience that teaches you how other road users may behave, and it can be a daunting experience for all new riders of any age. Fellow riders will always encourage and support and never ridicule. Where can we find Serena at weekends if she’s not on a scooter? When I’m not on my scooter (or at work) you will find me with my family or mooching about at home. Spending quality time with loved ones and good friends is a priority. We love family trips to air shows, zoos, picnics, walking, cinema …the new Bicester branch of Wimpy! To be honest, if I’m not sat on a scooter I’m washing it, polishing it, learning to fix it or idly flicking through t’internet to buy something for it! And finally… Vespa or Lambretta? Both! It’s like asking me to choose between my two children; I couldn’t possibly choose one above the other. Each one has its own special and endearing qualities and I love and adore them both.